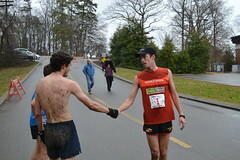 Southern 6 Trail Race winner Jacob Bradley wrote this race report for us after his win. Two years in a row! Congratulations, Jake. 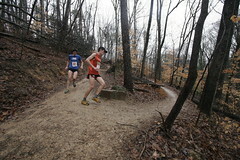 Click here for results from the 2012 Southern 6. Rainy, muddy, cold… Either sounds like a great run or just a good day at the office. Well, more like just a good race: the Southern 6 Trail Race. This year’s Southern 6k was all that and more. The course had changed from last year, but it was definitely a change for the better. The course was fast, but it had its fair share of hill climbs and rolls the whole time. I felt good throughout the whole race. Calvin Cofield (2nd OA) and I train together, so when I took a glance back and he said it was just him back there, I knew the two of us could just take it in. We were able to go out to the Biology trail for a training run on Tuesday the week of the race, and the conditions were almost exactly how they were on race day. So we were ready for the muddy conditions. Of course, you just can’t train for a fall, but a little mud has never hurt anyone. A wise coach told me once: “everyone has to run in the rain and mud at the same time, so don’t worry about what you can’t control and just run hard.” Well, that might not have been exactly what he said, but close enough. Like the race I’ll keep it short and sweet, some may call it a beginner’s race some may call it a kiddie k, but I’d call it fast. If you’re looking for beginner’s race, a fast trail race or just a chance for your kids to run a kilometer on trails, the Southern 6 has them all!